Bradley & Hubbard Manufacturing Co. Attributed to Bradley & Hubbard. 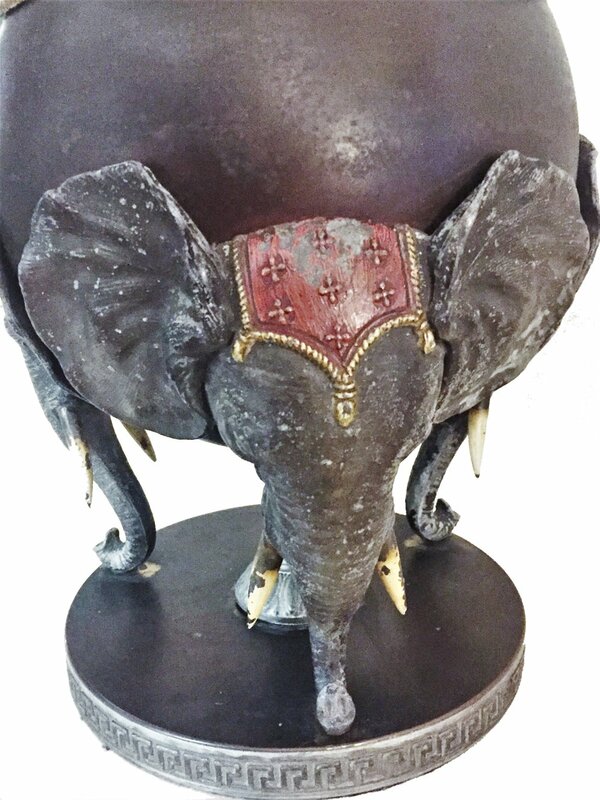 This rare ‘Elephant Lamp’ features a classic Bradley & Hubbard design of three elephants, holding a sphere. Beautiful patina with bronze appearance to original finish. Will work surprisingly in harmony with a mid-century modern room! Some enamel and patina chipped off but overall in good condition. The Bradley & Hubbard Manufacturing Company (1852–1940) founded in Meriden, Connecticut and over the years produced Art Brass tables, call bells, candlestick holders, clocks, match safes, lamps, architectural grilles, railings, etc. Overall, the company patented 238 designs and mechanical devices. 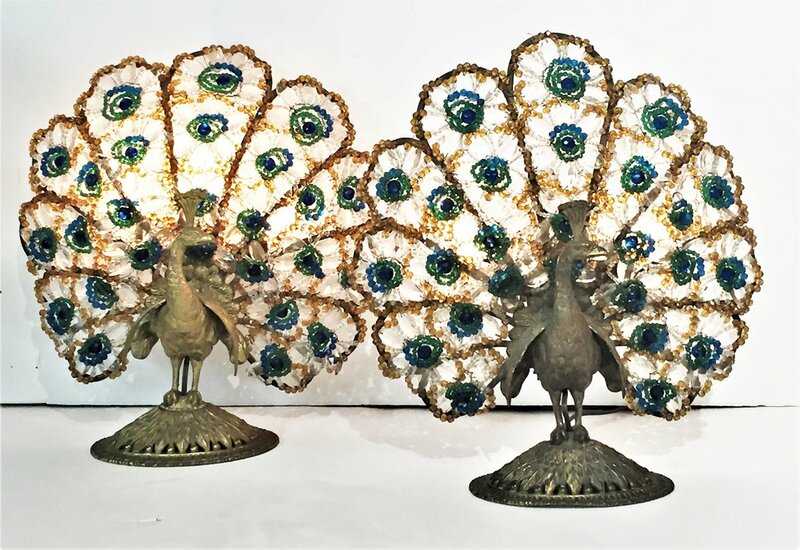 "By the 1890's, the Bradley and Hubbard name was synonymous with high quality and artistic merit," said Richard E. Stamm for the Smithsonian Institution, which has an extensive collection of Bradley and Hubbard manufactured design objects in its collection. In 1895, in a biography of co-founder Nathaniel Bradley, Henry Hall described Bradley & Hubbard as, "This company has enjoyed almost phenomenal success, and from a small concern, employing only six workmen, it has grown to own and occupy an immense plant of brick buildings, with a floor area of nearly seven acres, employing about 1,500 operatives, with offices and sales rooms in New York, Boston, Chicago and Philadelphia." In 1940, the business sold to the Charles Parker Company. As of 2016, over 175 Bradley & Hubbard designs are in North American museums and collections, including the Baltimore Museum of Art; the Brooklyn Museum; The Canadian Centre for Architecture in Montreal; Carnegie Museum of Art in Pittsburgh; Connecticut Historical Society, The G. Henry Ford Foundation in Dirborn, Michigan; the Historic New England organization in Boston; the Metropolitan Museum of Art in New York; the Munson Williams Proctor Arts Institute in Utica, NY; the Smithsonian in Washington; the Wadsworth Atheneum in Hartford; and Yale University Art Gallery in New Haven. A customized interior installation by B&H is also situated in the James Blackstone Memorial Library in Branford, CT. In 2006–07, Bradley & Hubbard designs were featured in an exhibition ‘A brass menagerie: Metalwork of the Aesthetic Movement’ curated by Anna Tobin D'Ambrosio in Utica, NY and New York City. Bronze stand, possibly, by Edgar William Brandt (1880–1960), who was a French iron worker, prolific weapons designer and head of a company that designed 60mm, 81mm and 120mm mortars that were very widely copied throughout and subsequent to World War II. The frosted glass lampshade is by Muller Frères Luneville. Muller Frères were French glassmakers, located in Lunéville, France. They were renowned for producing Art Nouveau glass works, such as vases and lampshades. The Muller family originally came from Alsace. Some members of the family worked together with Émile Gallé before starting their own business. 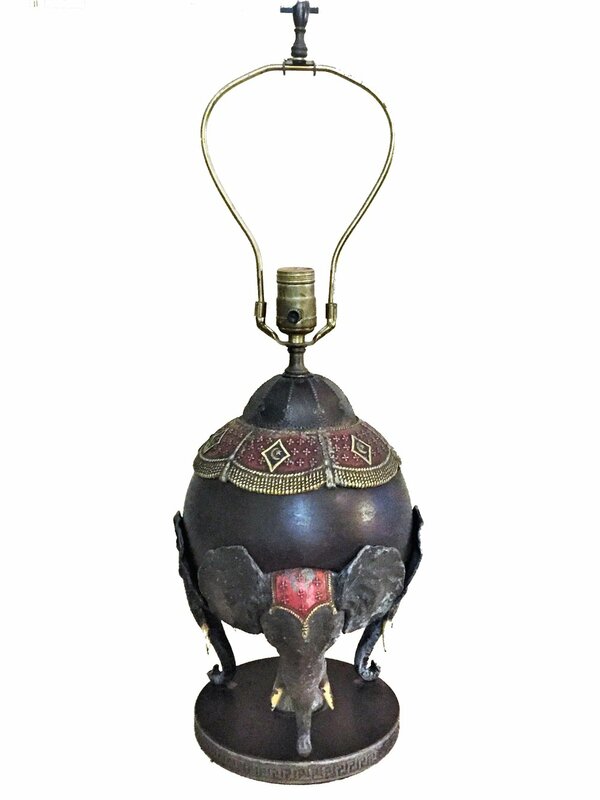 Bohemian bronze and glass jeweled pair of nightstand Peacock Lamps with three lights behind the tails, rewired. Dimensions: 16" W x 7" D x 16" H.
Dutch guilt (gold leaf) bronze, foundry stamp “EXNY” on the bases. This pair of Male & Female Caryatid Table Lamps, sculpted in the manner of Ignazio Giacometti and rendered in Dutch gilt bronze are hand-made by the famous New York-based fine art bronze foundry, Excalibur. 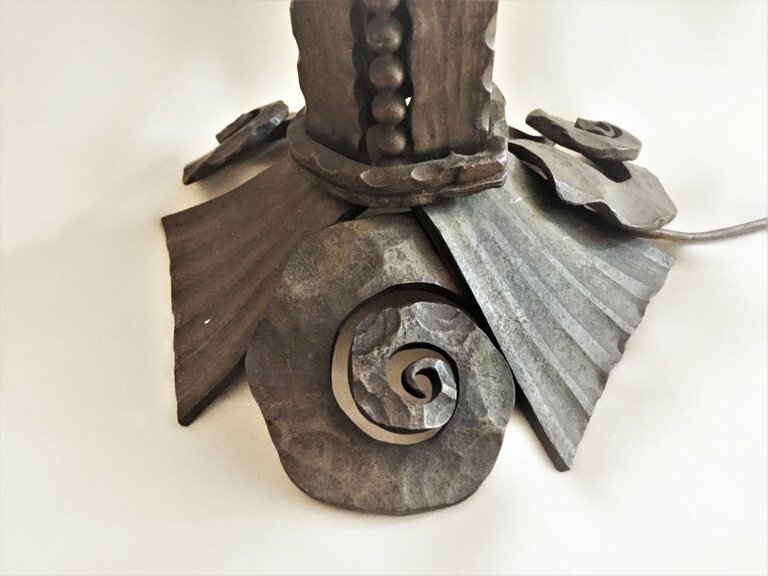 Over 50 years of its existence, Excalibur Bronze Fine Art Foundry has created excellent art, monuments and ornamentation for institutions and private clients alike - from public statues and monuments to fine art and custom residential installations and fixtures, they have covered all the ground. 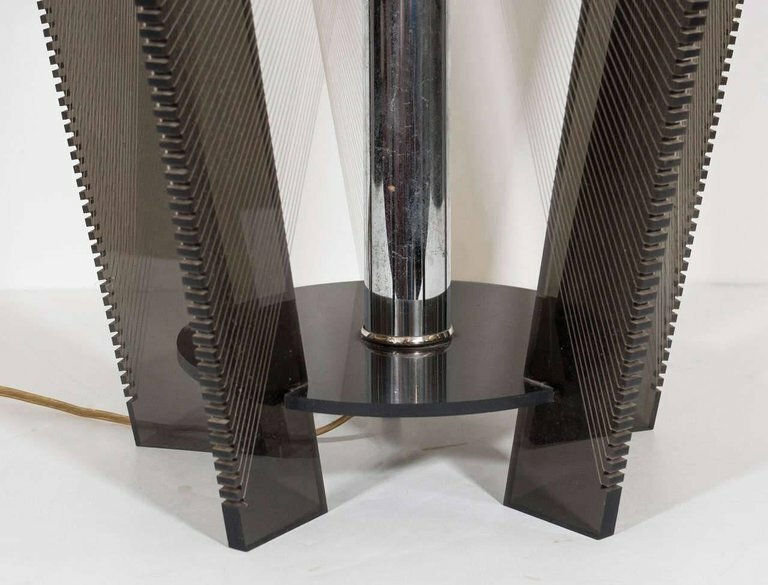 A pair of vintage American table lamps, likely intended for a club or lounge, produced circa 1980s, with central chrome stems, surrounded by five smoked Lucite panels, joined by two circular supports to the top and bottom, surrounded by a layer of threading, forming abstract patterns when interwoven. Wiring and sockets to US standard, each requires a single mirror bulb. Good vintage condition, with some light corrosion and patina to the chrome stem. 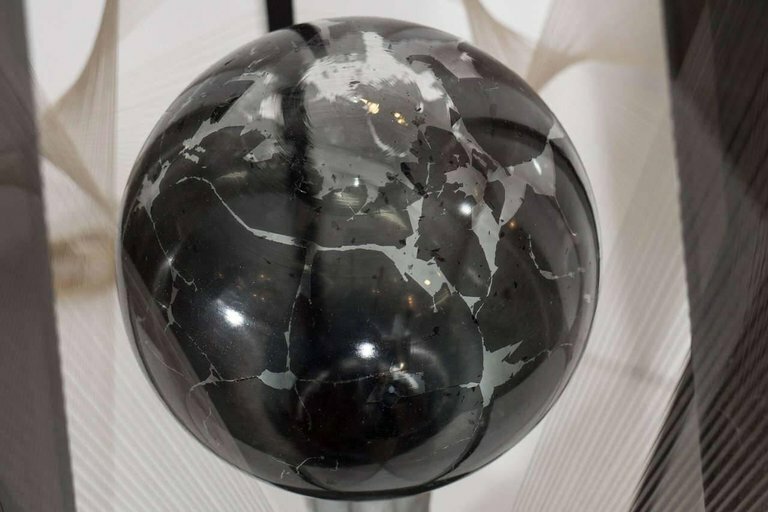 This elegant French Art Deco (circa 1930) table lamp combines the simplicity and brevity of lines of the rectangular onyx & marble base with the complexity and sophistication of the pattern done in the famous French technique, Champlevé covering with the multi-color enamel pattern the four copper plates mounted in onyx around the perimeter of the base. Champlevé is an enameling technique in the decorative arts, or an object made by that process, in which troughs or cells are carved, etched, die struck, or cast into the surface of a metal object, and filled with vitreous enamel. The piece is then fired until the enamel fuses, and when cooled the surface of the object is polished. The uncared portions of the original surface remain visible as a frame for the enamel designs; typically they are gilded in medieval work. The name comes from the French for "raised field", "field" meaning background, though the technique in practice lowers the area to be enameled rather than raising the rest of the surface. The technique has been used since ancient times, though it is no longer among the most commonly used enameling techniques. Champlevé is suited to the covering of relatively large areas, and to figurative images, although it was first prominently used in Celtic art for geometric designs. In Romanesque art its potential was fully used, decorating caskets, plaques and vessels. Champlevé is distinguished from the technique of cloisonné enamel in which the troughs are created by soldering flat metal strips to the surface of the object. The difference between the techniques is analogous to the woodworking techniques of intarsia and marquetry. It differs from the basse-taille technique, which succeeded it in the highest quality Gothic work, in that the bottoms of the recesses for the enamel are rough, and so only opaque enamel colors are used. In basse-taille the recesses are modeled, and translucent enamels are used, for more subtle effects, as in the 14th century Parisian Royal Gold Cup.